The Green Star certification process for building interiors will be more accessible with a fast-track system being introduced for the tenants of commercial buildings that have achieved Green Star status. 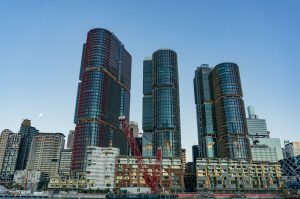 The new system is being pioneered by International Towers, Tower Two and Tower Three, at Barangaroo, who are the first to streamline certified, individual Green Star tenancy ratings for each of their tenants. Operated by the Green Building Council of Australia (GBCA), Green Star is Australia’s only national, voluntary, holistic rating system for sustainable buildings and communities. The new offering is an innovation stemming from collaboration between International Towers and the GBCA who are tenant partners of the building and aims to pave the way for broad uptake of the program around Australia. Sustainability has been embedded within the design, construction and operation of International Towers, with a commitment to achieve the GBCA’s highest rating, the 6 Star Green Star - Design, As-Built and Performance ratings representing world leadership. In turn, tenant partners are required to achieve 6 Star Green Star - Interiors ratings and contribute to the precinct’s Green Star Performance rating targets on an ongoing basis. A streamlined approach to Green Star certification has been developed to help tenants meet these requirements, with specific attention to material and equipment selection, documentation guidance and the certification process. The program also utilises the buildings’ existing Green Star features. The GBCA’s streamlined approach is a customised service allowing the certification of a group of projects sharing similar features, in this case commercial offices. It enables common elements to be certified once and then replicated on future projects to achieve a Green Star rating. This reduces costs, future proofs assets and helps more people enjoy the many benefits working in a Green Star environment provides. GBCA is looking to expand this service to other building owners, particularly those in commercial towers and shopping centres who wish to ensure and help their tenants deliver high quality outcomes. International Towers’ tenant partners are required to include sustainability features relating to site management, the indoor environment, energy consumption, transport accessibility, water use and construction materials. The Green Star team is helping ensure tenants achieve top results, with the considerable flow-on effects to their businesses such as reduced costs and increased staff retention rates. “Barangaroo is one of the most sustainable precincts in the world and the hard work International Towers and its tenant partners are putting in to achieve 6 Star Green Star ratings shows a commitment to this vision,” says Romilly Madew, chief executive officer of the GBCA. In addition to achieving Green Star certification, International Towers was the first Australian development to achieve a Platinum WELL Building Standard Core and Shell rating, and the largest in the world to achieve the accolade. WELL is an international standard built on research into the intersection of human health and wellness in the built environment. It focuses on the design and operations of buildings encompassing features such as air, water, light, comfort, nourishment, fitness and state of mind. WELL also incorporates the impact of office building design and construction, interior design, materials and fixtures, along with biophilic elements as well as location and access to amenities, such as public transport.